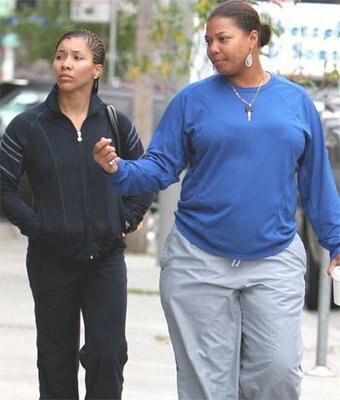 JuiicyScoop: Queen Latifiah and Girlfriend Breaking Up?? I'm probably the only one who still doesn't think the Queen is gay.. but apparently some people do. Rumors are running rapid that the Queen and her longtime boo Jeanette Jenkins, who also happens to be her trainer are on the verge of splitting up. Perez Hilton reports that they "have been arguing a lot lately, and that "were seen getting into fights at their hotel - the SoHo Metropolitan - two nights in a row recently."